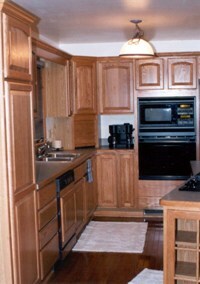 Kitchen remodeling, like any other room, can be as basic as repainting the walls and ceiling. There's nothing like a new coat of paint, or maybe a change of color to freshen up the room. What about the flooring? Is it still in good shape, or does it need some attention too? Whether you prefer vinyl sheet flooring, ceramic tile, laminate flooring, or hardwood, the choices available today have grown at an incredible rate. Want another way to change the appearance of your kitchen? 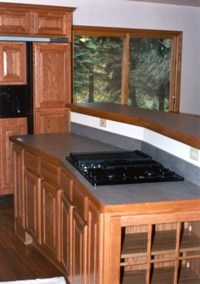 How about a new counter top? Here again, the options are many. The choices in laminate (Wilsonart and Formica brands) colors and textures have grown so rapidly, it's almost hard to keep up with what's available. Ceramic tile counter tops are also popular in some areas of the country. ...and let's not forget natural granite, as well. If you're looking to make significant changes to the room, replacing the cabinets is the next logical choice. With all the door style, wood species, and color options available, there's bound to be something to suit your taste and style. A note of caution here...there are many cabinet manufacturers serving the market today, at many different price points. Some are national or even international in their market coverage, while others are smaller, more local, and semi-custom, or custom in nature. Very often, the varying price points are determined by the way the cabinet boxes are built, and the materials used to build them. Generally speaking, cabinets are a product that seem to fall into the "get what you pay for" category. When looking at new cabinets for your kitchen, pay attention to what goes into their construction, how the drawers are assembled, if the doors are solid wood or laminate, if the boxes have enclosed backs, or is the manufacturer trying to save money by leaving the backs open. All these things will play into the final cost of the cabinet, so be sure to compare before you decide. A major kitchen remodel can entail changing the entire footprint and layout of the room. Whether moving one or more walls, or even adding an addition to the home to expand the area, this level of work can involve a significant amount of time, and usually involves revisions to the plumbing, electrical, and often heating aspects of the home's construction. This work is not to be taken lightly, requires a significant amount of planning, and should really involve a professional contractor, and the appropriate licensed trade contractors as well. Attention to building codes, and the ultimate safety of the inhabitants needs to be considered, and addressed. Proper planning is key to any successful remodel, and although there are times when some unforseen situation might arise, that's less likely to happen, and less likely to significantly impact the outcome of the project if the advanced planning has been done carefully. If you'd like some additional help with the idea and planning part of the job Dream-Kitchen-Ideas.com is a website dedicated to the home owner who is short on kitchen remodeling ideas. Whether planning to do the work yourself, or hiring a contractor like Eran Building & Remodeling Co. this website is sure to help get the creative juices flowing. For another great site to get the creative ideas going, visit our friends at Kitchen contractors Toronto. 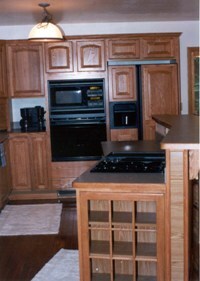 Their website is also filled with a lot of good information and photos of a variety of styles of updated kitchens. Setting a realistic budget is another considertion. Though there are varying price levels for the many products you may wish to include, it's typically advisable not to skimp on quality. It may come back to haunt you later on. If you're uncertain about the budget aspect and just what to consider as a target number, perhaps the most recent issue of Remodeling magazine's "Cost vs. Value" report might give you something to think about. The annual report uses set criteria for a variety of remodeling projects. The projects are then priced around the country, and the final values are adjusted according to location within the different regions. Due to our proximity to the City of Cleveland, Ohio, if you are viewing this locally, you should be able to look at the report for the Cleveland area here for as long as it's available online. Outside the region, use this link, if you'd like to look at the report that most closely represents your area. I'm happy to be able to say that typically and historically, Eran Building & Remodeling Co. has been able perform similar work in our areas of expertise for less than the stated costs due to careful planning, careful product recommendations, and working hard to keep our own overhead and costs at a reasonable level. If you live within our service area, and would like assistance with your kitchen remodel, please call (330) 678-5787, or use the form on our Contact page. I would be happy to speak with you about your project. andHome-Improvement Related Links Directory Discussion Forum - Discussion community for home remodeling, renovation and repair. Then why not use the button below to email the web address to a friend, or add us to your favorite bookmarking service?